FormZ is great for woodworkers as a modelling tool. It also has the Information Management palette to get the data out to a csv file and from that, into a cutlist program. 2 files attached: a translation spreadsheet in .xls format which can be opened in Open Office Calc or Microsoft Excel, among others, and instructions in the PDF file. Nice PDF Tutorial! Lots of Step by Step documentation (that I was not expecting before opening the PDF). Here's just one screen capture from the document! Thanks. I've had a quick skim read of the tutorial and potentially looks like something that might be useful. I'll go through it in more detail and let you know how i get on. Duncan, I look forward to hearing how you get on. If you will use it regularly, it is well worth recording a macro in Calc or Excel to speed up the process of conversion. FormZ is great for woodworkers and deserves greater exposure, especially with the improvements in version 8 and the availability of FormZ free which brings it within reach of casual users and even for users' customers to use as a 3d viewer and more. Just to let you know I think you did a great job of this. I have been tinkering with this exact issue (creating cut lists from FormZ models). I ended up taking a different route, which involves exporting into another CAD program first. I would, however, love to stay in FormZ for modeling, shop drawings, and cut lists. What you’ve accomplished is a major step in this direction. Layout just needs a few improvements and everything could be done under one roof. It’s worth noting that I convinced the developer of the other CAD program mentioned above to create a utility inside their B.O.M. function to do what you have done (the data exports from the CAD program already sorted). It parses the x,y,z extents or ‘bounding box’ data so that a ‘length’ field is always largest, and ‘thickness’ is always smallest, and ‘width’ is always in between. Maybe something the FormZ team would be interested in? This would be a benefit to not just woodworkers, but anyone who works with parts created through deduction (wood, metal, glass etc.). I absolutely agree that FormZ deserves more exposure in woodworking circles. Thanks for your post. 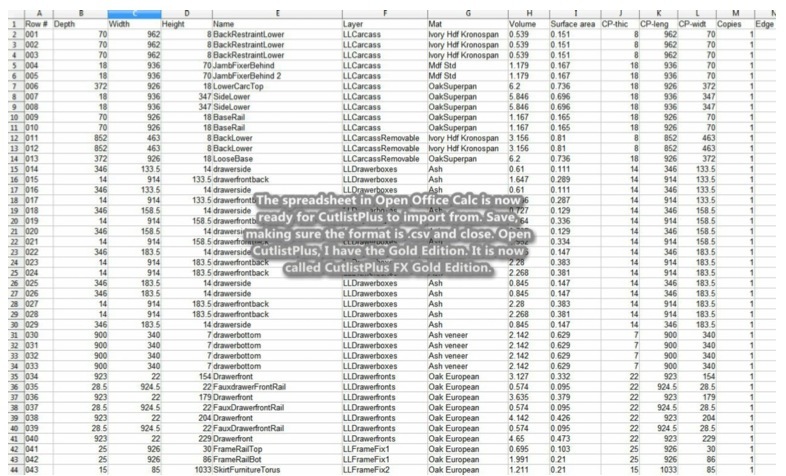 I fully agree that it would be useful if the output from info-management were pre-sorted, however you will be able to get the info into cutlistplus surprisingly quickly once you get used to the routine and use a keyboard shortcut in Excel or in Open Office Calc to activate a macro to do most of the magic instantly. It's like many routines, once you get used to them, they become second-nature, however it would be amazing if there was a plugin for FormZ to export directly into cutlistplus.....or perhaps not, as I do tend to need to make a few adjustments to the spreadsheet, omit a few unneeded items for example, and that is easier to do in the spreadsheet than in cutlistplus. I suppose I am reasonably happy now with the way it is because I can get work done pretty quickly with this routine, but there are other priorities in my opinion, for the developers like improving the user interface to maximise real estate by improving palette sizes and labels, especially when inactive, and developing some of the plugin functions which were lost with the introduction of plugin labs. This year I have organised my models of furniture into numbered assembly groups and isolate each group in turn to name parts effectively and afterwards add serial numbers semi automatically all with the Rename Objects extension. That leaves 'layers' free to use within any assembly group. This is great because no matter what part I find on a job, I know which group it refers to and does not require much effort to perform as the serial numbers can be set straight after cleaning up the object names one group at a time with the Rename Objects extension. Hoping one day that FormZ pro will fully integrate with CutlistPlus FX like some other modelling programs have done. Sounds great Alan, thanks for sharing! Update to routine: The last few months I've been more careful to model wooden parts orientated Z for length (height), X for width, Y for thickness (depth) and to make object axis corrections for individual parts by using the Edit Axis tool which is pretty efficient for rotating individual object axis by 90 degree steps. Having correctly orientated parts improves output for information-management BOM output, requiring less editing of the spreadsheet prior to importing into a cutlist program. We are now finding the conversion of our FormZ bill of materials csv output to a format which Cutlistplus can import a very simple process by use of a macro recorded in open office calc. Please note that the parts are organised in numbered 2 digit assembly groups and 2 digit part numbers (serial numbers) which are produced with the FormZ rename objects labs extension tool. It puts a space in between the group number (suffix) and the serial number which is placed after that, so our parts have 5 digits including the space, which works well for us. (Set the appropriate padding in renamer serial numbers to include any required leading zeros). Others might prefer 6 or 7 digits in total depending on how many objects you have in your assembly groups, and the macro would need to be adjusted for this to take 6 or 7 digits across to the part number column using the RIGHT function instead of 5. Here is the macro we use in open office 4.1.6 calc, attached here as a rich text file. Even those of us who are not familiar with programming can recognise a logical process and command pattern structure within it. Please note that just before we apply the macro we have to select all cells in the csv file. I hope this encourages more woodworkers to use the combination of FormZ pro 8 and above and Cutlistplus FX (gold or platinum) as they make for a superb workflow and help to keep material waste to a minimum.